Leading network TAP manufacturer, Garland Technology, has partnered with NextComputing, the premier supplier of open, full packet capture systems. Together, they will provide joint solutions for 100% lossless packet capture for forensics, security and monitoring applications. Buffalo, NY—Garland Technology, the leading manufacturer of network TAPs (test access points) has announced a technology partnership with NextComputing, the premier supplier of open, massively scalable, full packet capture systems. The partnership began in early 2016 and is rapidly developing to include joint solutions for NextComputing’s Packet Continuum Cluster and Packet Continuum Portable applications. In a recent webinar hosted by the Fuel User Group, Chris Bihary showcased how the integration of Palo Alto’s Next-Gen Firewall, combined with NextComputing’s Packet Continuum Cluster can be utilized with Garland’s EdgeLens®, to facilitate time critical workflows for security incident response. “It’s exciting to be partners with NextComputing because they are leading the industry with their packet capture systems. Because our Edgelens® is a hybrid bypass TAP and packet broker it can provide identical traffic to an inline NGFW/IPS as well as NextComputing’s off-line Packet Continuum capture appliance. When both devices receive identical traffic streams, it allows for precise correlation of events through extracted PCAP files.” said Chris Bihary, CEO/Co-Founder of Garland Technology. Garland Technology’s EdgeLens® was designed specifically as a connectivity tool to monitor the network’s edge, and as a centralized management tool for multiple security and management tools. “The partnership with Garland Technology and their EdgeLens® plus Packet Continuum allows for a variety of use cases, including recording traffic before and after the in-line device. This is beneficial when auditing new policy signatures to ensure they operate correctly,” said John Ricketson, NextComputing’s Executive Vice President. NextComputing is the premier supplier of open, massively scalable, full packet capture systems. Our Packet Continuum technology achieves lossless capture to disk at high line rates up to 40Gbps, real time indexing, in-line data compression, PLUS simultaneous query and deterministic retrieval of pcap data. 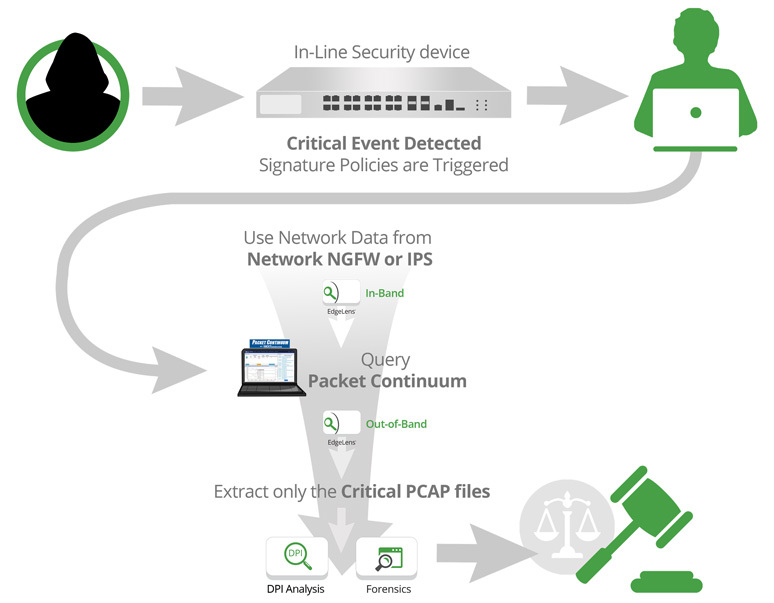 Active Trigger alerts and packet analytics make Packet Continuum ideal for cyber security protection, incident response, and network trouble-shooting. Packet Continuum software operates on a standalone appliance (portable or rackmount), or across a cluster of enterprise-grade servers, for massively scalable forensic timelines and advanced analytics. Learn more at http://www.nextcomputing.com. Garland Technology guarantees precise data monitoring capabilities with a full line of network access points (TAPs) including: network TAPs that support breakout, aggregation, filtering, regeneration and bypass modes; packet brokering and load balancing; all available in portable or 1U or 2U modular chassis systems. Garland network TAPs support all networks, including copper wire in 10/100M, 10/100/1000M and fiber in 1G, 10G, 40G, 100G. Garland’s network TAPs avoid introducing additional software that could be a point of failure to your network. Garland’s design and educational-based approach includes a team of network designers to work directly with you and your team to meet your network access and visibility needs and provide you with the best solution for any monitoring or security appliance – allowing you to see every bit, byte and packet®. For more information, visit http://www.garlandtechnology.com.